Cinco de Mayo (or May 5th) is the celebration of the Mexican army’s victory over the French in 1862. A victory that is rarely celebrated in Mexico but one that has evolved in the U.S. to be a day of honoring Mexican heritage (not to mention parties!). So if you’re gonna party* tonight, we thought we’d give you a quick look at the best and the worst of alcoholic drinks when it comes to your health. * We are in no way endorsing binge drinking. Be sensible! 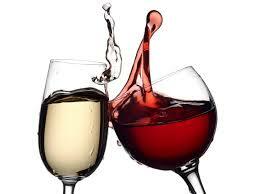 There are more healthy benefits from drinking red wine than any other alcohol…because red wine contains anti-oxidants. the risk of heart attacks and cancer, and Catechin and Proanthocyanidins (found only in the seeds), which reduce oxidative damage in the body. Resveratrol and Proanthocyanidins are the two main anti-oxidants that protect cardio health. Still, it’s improtant to not drink more than about 150 ml (5 oz per day). Around that amount seems to reduce the risk of heart disease by 32%…any more than that and the risk goes up dramatically. Reduced risk of dementia: Drinking 1–3 glasses of wine per day has been linked to a reduced risk of dementia and Alzheimer’s disease. Reduced risk of depression: A study of middle-aged and elderly people showed that those who drank 2–7 glasses of wine per week were less likely to become depressed. Reduced risk of type 2 diabetes in women: Moderate red wine consumption has been linked with a reduced risk of developing type 2 diabetes in women. colon, basal cell, ovary and prostate cancers. What it boils down to is the simple fact that too many calories is what will turn your trim six-pack abs into that unsightly beer belly. Again, the key is moderation, because too much alcohol intake stops fat burning…it can cause the extra pounds to pile up in the midsection. 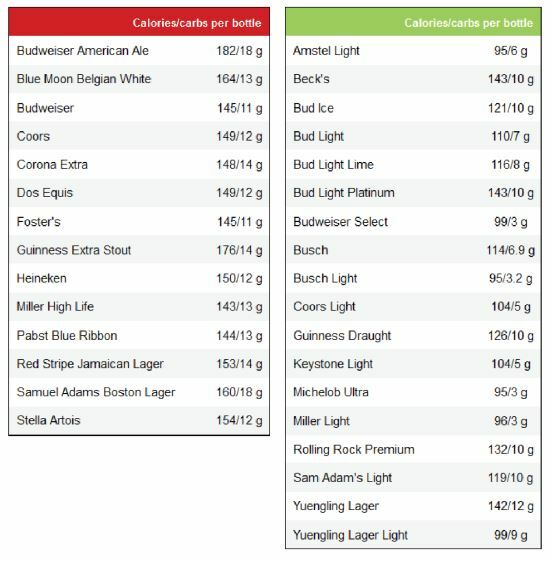 Since 1 beer averages about 150 calories…think what 4-5 will do? There’s another factor: Too much alcohol increases appetite, so what are you eating with that beer? And if you are a serious exerciser: Research from the Strength and Conditioning Journal suggests that binge drinking (more than 4 beers) appears to suppress the production of testosterone (hormone vital to muscle growth). (25ml) (liquor) (distilled spirits): Vodka, gin, whiskey, brandy, rum, etc – 52 calories unsweetened, distilled alcoholic beverage Liqueurs (25ml). 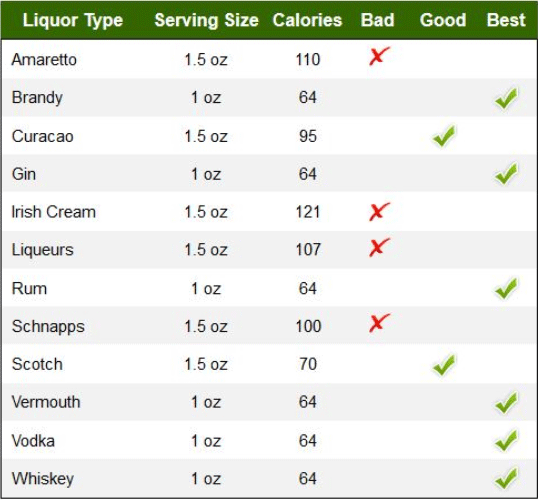 Sweetened distilled alcoholic beverages – 100-600 calories. While most hard liquors contain about 64 to 80 calories per shot, most people don’t stop at just one shot. Just 3 shots could add up to 320 extra calories. 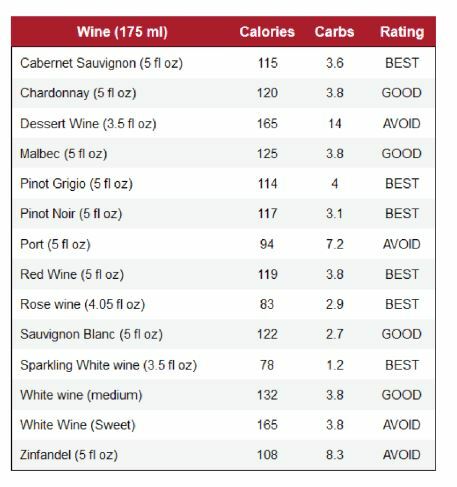 And if the liquors contain mixers like orange juice, tonic or ginger ale, you’re looking at a lot higher calorie count. Liqueurs (or hard liquor): A liqueur is an alcoholic beverage made from a distilled spirit that has been flavored with fruit, cream, herbs, spices, flowers or nuts and bottled with added sugar (typically high fructose corn syrup) or other sweetener. They typically contain 35% alcohol after distillation; they contain (spirits or liquors): vodka, brandy, tequila and gin. Vermouth with only 64 calories and around 17% alcohol. This liqueur is top choice if you don’t like wine, as a study from Budapest says it’s packed with polyphenols, which ironically enough promote weight loss. Better choices in liquors: Straight hard liquors are your best choice, as they are all around 90-100 calories per shot, but avoid the flavored ones like spiced rum or flavored vodkas. If you have to have flavor, add seltzer and a lime/lemon. have one, just make it with fresh lime juice. Long Island Iced Tea: This contains almost every hard liquor you can think of: rum, gin, vodka, tequila, sour mix, and then cola, giving it more calories than one meal, at around 425 cals. Skip the sour mix (sugar) and add only fresh ingredients. but it won’t be as creamy. Irish coffee: Whipped cream, Irish whiskey and sugar result in about 300 calories for 1.5 ounces. Pina Colada: About 600 calories on average! Mai tai: Rum (light, dark or spiced) pineapple juice, liqueur, giving it about 350 calories. of saturated fat. Substitute with 2% milk for a lower-calorie alternative. Daiquiri: Around 450 cals (Rum, lime juice and syrup).